Experienced a trauma that is still affecting your day-to-day life? This is the creation of Robert Shields, Principal of the Robert Shields College of Hypnotherapy, (England) where I earned my Clinical Hypnotherapy diploma. Effective in eliminating fears and phobias, the client must be able to recall the specific incident which caused the fear/phobia, otherwise ongoing hypnotherapy sessions are required to uncover the specific incident. Assuming the patient remembers the incident, he/she then sits face-to-face with myself, retelling the event in detail to me. I then retrain and shift in minutes how the patient is recalling the memory, for example, shifting it from an emotional situation to purely logical/intellectual/matter-of-fact, without emotion involved! It is then merely an incident which could have happened to a stranger rather than to the patient. This accomplished by using Robert Shields' simple, effective, and original method known as F.E.T., or Fear Elimination Therapy. Clients no longer have a fear of flying, swimming, dogs, birds, spiders, snakes, or anything and everything that might have been hindering their living their life to the fullest. This includes traumas of all sorts. Results are immediate and permanent. Often times at the end of the session the patient is so relieved at seeing and experiencing the trauma In a completely different way, that the once again laugh and smile. I am the only one in B.C., Canada qualified and certified through the Robert Shields College in England (May 2004) to do this therapy. For more details on how F.E.T. works, go here. "My fear of flying is gone, now I can save time on business trips! Thank-you for helping me to free myself!" "I no longer feel anxious this time of year! Thanks so much for this." "A trauma I had when I was six years old has been lifted, thanks to the F.E.T. I feel lighter and happier now. I would recommend this to everyone!" To book your session, go here. "Change Your Mind, Change Your Life!" The inspiration for this was the Mind-Treatment techniques of Therapist Phineas Parkhusrt Quimby. 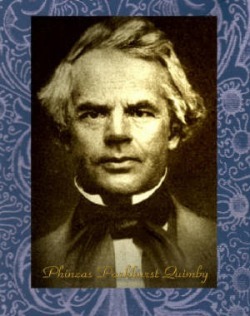 Quimby changed people's lives by utlizing mild hypnosis/meditation and a combination of healing/eliminating emotional traumas by instantaneously and permanently substituting healthier, more positive and constructive thought-patterns for the former traumas/memories. The forerunner of modern day psychotherapy and analysis, Quimby's Mind Treatments influenced the greats such as Sigmund Freud and Carl Jung, and was practiced successfully by Quimby many years before Freud and Jung. The influence of this amazing therapy can be still seen even today, within the practices of N.L.P., Transpersonal Psychology and Cognitive Therapy, to name just a few. Today, Doctor of Metaphysical Science and Ordained Metaphysical Minister Dr. Michael H. Likey, utilizes the Mind Treatment techniques as ALPHA-QUANTUM THERAPY, named for the hypnotic/meditative brainwave-state utilized during the therapy, ALPHA, and in honor of the "DIVINE MATRIX" (God/Source/Universal Mind), a term used in QUANTUM PHYSICS. Quick, painless, and PERMANENT, Dr. Likey, after conducting an Intake (information-gathering part of the session, early on) to uncover the origins/root-causes of the patient's unwanted thought-patterns, then proceeds to gently guide the client to emotional wellness and happiness by substituting/anchoring emotional traumas for strengths, and reinforcing them as permanent BELIEFS: both sit face-to-face, and the client, in a light daydream-like state absorbs the newer, healthier outlook and suggestion of Dr. Likey. The client can then move forward, enveloped in self-confidence, with goals no longer obstucted by fear and doubt. During the De-Briefing (wrap-up/summary of the session), Dr. Likey utilizes the Kinesiological technique of "Muscle-Testing" to prove to the patient that the "new-found them" is now permanent.The patients true potential can then be realized. During an ALPHA-QUANTUM THERAPY session, the clinically-proven "PSYCHO-PHYSICAL UNIT" concept that our mind affects our body, and our body affects our mind comes into play: healing emotional issues (which one can say are on a SOUL-LEVEL), allows a healing of the MIND and then potentially the BODY. Heal the SOUL, which heals the MIND, which heals the BODY! A truly HOLISTIC APPROACH. Dr. Likey's book about Alpha Quantum Therapy(c)/Mind Treatments is now available! Dr. Likey gives regular seminars on demand on how to do ALPHA-QUANTUM THERAPY/MIND TREATMENTS! Book an ALPHA-QUANTUM THERAPY/MIND TREATMENT SESSION! TIME REQUIRED: One Hour. Suggested donation $120. "Thank you for the mind healing session. It is absolutely amazing. I am so excited about how I'm feeling. I feel whole and light physically, mentally, and spiritually. Since the session I feel so free. To experience the physical symptoms starting to disapear right after the session, and GONE the next day was amazing. My throat has cleared and there's only abit of residue still clearing. I am so moved by this, and thank you for making it so comfortable and easy. I wish everyone believed this and be able to live a more happy and healthy and fulfilled life. I am so very moved and blessed I could experience this. Thank you for your unique work and being you." "The most remarkable difference was that the emotional charge my mind used to get with my thoughts was gone-and that charge was what was causing all of the grief. I saw this lack of emotion as an opportunity to "fix" some of the thoughts going through my head. I saw it as an opportunity to clear the thoughts in my head and see them for what they really are." Dr. Michael Likey is a double-Doctoral graduate (with a Doctor of Divinity and a Ph.D. in Mystical Research) of the oldest and most respected University of Metaphysics in the world, Dr. Leon Masters' University of Metaphysics, and the University of Sedona, both located in Sedona Arizona, U.S.A. Doctor of Metaphysical Science, Ordained Metaphysical Minister, Spiritual/Metaphysical Counselor and Practitioner, Dr. Likey is also a certified Clinical Hypnotherapist, Reiki-Master, teacher, lecturer, and author. Dr. Likey is also legally registered to officiate at weddings, baby-blessings, and funerals. Founder/CEO/Spiritual-Director of his Sunday-morning program, Dr. Likey provides Intuitive/Divine Guidance for his students, clients, and patients, in addition to providing free, accessible resources via his online Self-Help WorkshopTelecasts, and Internet Radio/Television Broadcasts. You can be sure that when you invite Dr. Michael to your event as a guest speaker/lecturer, or for a day workshop, you are guaranteed a successful, enjoyable event.